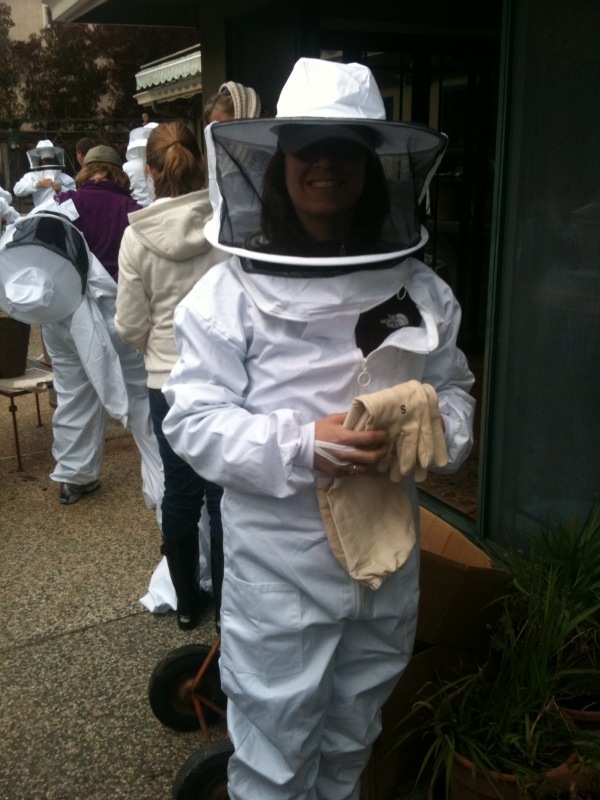 At my beekeeper class, learning all about bees and honey do. A year ago, Amber Strocel wrote a guest post here at the Booth about washing her face with honey. She referenced her sensitive skin as well as her concern for chemicals as the reason for choosing honey. I was intrigued. My dermatologist calls my skin "exquisitely sensitive." I call it haggard and blotchy. I've never found a face wash that hasn't left my skin drier, tighter and even painful. I also have rosacea and have not received much relief from over-the-counter or prescription treatments. So, after a year of hemming and hawing about washing my face with honey, I attended a beginner beekeeping class. The beekeeper lauded the benefits of using honey at home. His adolescent daughter used it as acne treatment. His wife worked at a hospital where honey was employed to treat cuts instead of polysporin. I headed home with three jars of his honey and a determination to stick at least one of them in the bathroom. That same day, I switched from sugar to honey for my tea and am sneaking honey instead of sugar in here and there in my baking. 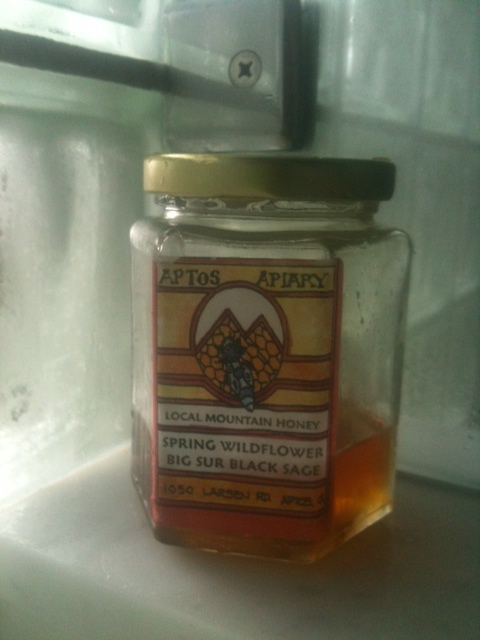 Unlike sugar, I can get honey locally and packaged in a reusable glass bottle. Moreover, honey is supposed to boost your metabolism and such. I've also used honey for years to treat burns. It has prevented many a scar for this clumsy chef. Plus, honey and cinnamon not only makes the medicine go down. It is the medicine for a common cold. Lastly, I began using it in lieu of conditioner - on the tips of my hair. It works well, doesn't contain anything I cannot pronounce, and leaves me feeling sweet all day! With all the things that honey can do, I'm left wondering just what it can't do? * Join the Facebook page and stay sweet all week long! * I'm linking to the Homestead Barn Hop for this post. Isn't it amazing what all it is good for? My dad kept bees for years, he always told people how good it was for you! Intrigued! Do you just smear it on then rinse it off, or is there more to it? @Clint - Your dad knew what he was talking about! @Charise - Ohhh, peanut butter and honey? Best ever. @Eco Yogini - Isn't it great? At first, I felt like it was too expensive or wasteful and then I compared it to the over the counter and RX stuff and was like, duh! @Sara - I wet my face with warm water, smear it on taking care to rub it in on trouble spots (like where I have rosacea or a break out). Sometimes, I'll let it hang out for a few minutes and other times, I just wash it off. It's super easy and makes you feel sweet all day long. Amber's post convinced me to use honey as a face wash and I love it! I'll have to try some of these other suggestions. Thanks!! When you use it as a conditioner, do you rinse it out or leave it in? I'm thinking of trying straight aloe vera as a conditioner too. I think honey is one of the true magic foods out there. This is a fun list! I burn myself all the time too. Next time I'll try honey. I to have very sensitive/reactive skin and have found honey to be the perfect face wash. I keep a jar of it in the bathroom and every night before bed my kids dip in claiming that they have 'sore throats'!! Will it remove eye makeup/mascara??? Is it safe to get in your eye? @Sustainamom- Lucky you for listening right away. I now wonder what took me so long. @Betsy - I wonder how the aloe will go. For me, I leave it in for 5 minutes and then rinse it out. @artemisinva- I'm not really sure about whether it will remove mascara. I use a natural mascara that is made of wax or something and is nearly impossible to remove - therefore I don't wear it much. I have gotten the honey/water mixture in the eye before and it was fine. I had Amber's post starred in my Reader since it was posted and didn't get around to trying the honey face wash till about a month ago. Picked up raw honey from the farmers market, from probably 100 miles away. I'm oily/combo/breakout-prone. Verdict? After 2 weeks of washing only with honey, I didn't see much of a difference in my face. No more or fewer breakouts. But, it didn't dry out my face nearly as much as other soaps. I'm willing to give it another go though. It costs as much as I pay for facewash, and if does the same thing, I'd much rather pay the bee man for it! I'm a honey face wash girl too! Any way we can reduce our toxic load and still get the job done - I'm in. Love it. Love your Pinterest boards too...am now a follower. @AP - " I'd much rather pay the bee man for it!" Hear hear! @Wonderwoman - Aw shucks, thank you! Agreed on the toxic load! Like AP said, even if it just does the same thing for the skin as a commercial face wash, that's good enough for me.